The resort and apartment are not suitable for individuals with serious mobility, sight or hearing difficulties. A car is necessary to access the resort. Take the A379 Kingsbridge — Modbury (which is south of the A38 Exeter — Plymouth). At 1.5 miles south east of Modbury take the B3292 to Bigbury-on-Sea and keep going until you reach the sea. See also "How to find us" elsewhere on this website. Having passed the public car park entrance take the first left and use the allocated code to open the main gate. The apartment parking space is marked “5” and is almost directly opposite the main gate. There is good rear vehicle access. Walk the 50 yards West across the car park to the third staircase along. Take one step up, 8 steps down then 1 step up to the apartment block entry door which you can open with the allocated code. Take the lift to the ground floor and on exiting the lift turn left and open the key safe next to apartment 5 front door with the code supplied. There is low-level lighting in the car park and stairs to the apartment entrance but a torch is always a useful supplement to carry. Other pages of this website provide links to information on beaches, pubs, shops and restaurants — see "Local activity directory" and "Best things to do" elsewhere on this website. A printed copy of this information is provided at the apartment in the information folder. The nearest village with a selection of shops is Modbury which is five miles from the resort. Full facilities are available in the town of Kingsbridge some 10 miles from the resort. 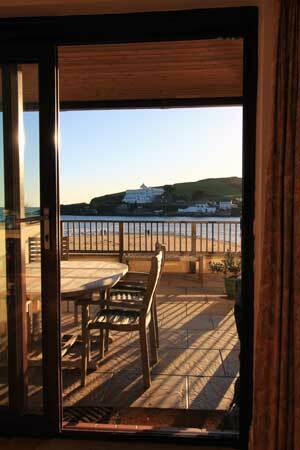 The Burgh Island Causeway apartments are on three floors. There are lifts, with emergency phones, serving all floors. The leisure club is on the ground floor and accessed by a lit concrete path. This path is one step down from the apartment. Both entrances to the leisure club reception (normally open 10am to 8pm) are accessed via five steps. The leisure club is well lit, carpeted, and has comfortable seating. There is a disabled toilet in the leisure club. The club has separate male and female changing rooms of a communal nature each with its own shower, WC, washbasins, and benches. There is single door access to the gym, sauna, and pool. The floor is tiled. There are 6 steps down to the pool. The leisure club cafe facility provides drinks and a displayed menu of meals. Table and sofa seating is provided as is service at a counter or to your table. In good weather refreshments can be taken on the slate terrace. The 'Warren' area (accesses on foot from the car park) is a large mostly flat area of grassy cliff top which at its southern edge slopes sharply and naturally down to the sea. The leisure club gate provides access to the slipway which itself slopes 25 yards to the large sandy beach. The beach has life guards in the summer. The apartment is on the ground floor. It is well lit (primarily halogen) with the added flexibility of bedside lights and a standard lamp in the living room. All flooring is tile or bamboo except those in the the bedrooms which are carpeted and a rug in the living room. All doors are single opening (700mm) and on strong springs. All heating can be temperature controlled. The TV/DVD/Hi-if all have remote controls. There is a fire alarm system and two exit routes. One exit is through the large patio area and the other through the apartment front door. Small fire fighting equipment is provided at the apartment. Full instructions for the resort, the apartment and the equipment in the apartment are located on the coffee table. Children & dogs are welcome. There is relaxed seating with room for six people in the living area and two separate sets of tables and chairs; one inside and one on the patio. There is one step down to the large paved patio which is secured by walls and railings. The double bedroom is en suite to the bathroom. The bath has a support rail and mixer taps. The twin bedroom is en suite to the shower room which has a support rail and thermostatic shower with a 15cm lip. The apartment floor plan shows the layout of the facilities and you can take a virtual tour of the apartment. If you require any more information about access please contact us. This site was designed and created for Burgh Island Causeway by PW Consultants — Web Presence Creators.